We all have a soul purpose in life and at times understanding who we are or what we are meant to be doing or being can be confusing. Numerous demands and pressures set by society’s expectations, family and friends can at times confuse our soul purpose. Soul Work Coaching helps you too achieve your goals in numerous sectors of your life using a metaphysical approach by understanding who you are. 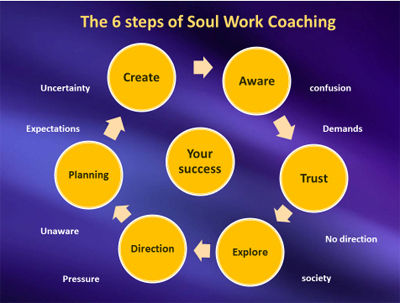 Soul Work Coaching has been tailored to allow you the choice of how many sessions you need and when you need them, giving you specific tools through, Self-Awareness, Trust, Exploration, Direction, Planning and Creation to maximize your own ability’s in helping you to achieve your goals. Each soul work sessions lats up to 60 minutes in Duration. Please do not pay for a session without confirmation of a booking.